Don't you love FREE Food? Call ahead to check with your location to see if your Chick Fil A is participating in this Leap Year Chick-Fil-A Minis giveaway. 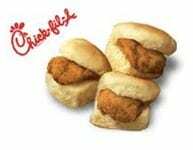 On Wednesday, February 29, 2012 (Leap Year), Chick-fil-A is giving away a FREE four count of Chick-n-Minis. You can pick it up between 6:30 a.m. – 10:30 a.m. Limit is one per customer and no purchase is necessary. Check your nearest Chick-fil-A to see if it will participate in this event.